When I was teaching school, my personal life morphed into a crazy quilt pattern, with some heavily embellished patches, but no organized pattern. The “in the ditch” grind of curricular demands left my emotions with frayed edges. What I needed to remain creative and compassionate as an educator was a group of women who did not work in a school with children. At this desperate point in my life, Joyce Beenes invited me to the Oak Lawn Stitchers Group, which met at the Christian Reformed Church. From the first moment I ventured into the Fellowship Hall, the scent of fresh coffee and chocolate treats bid a tasty welcome. Long tables lined the walls with sewing machines set up by quilters. The sight of dog feeds pulling fabric to pulsating needles ignited the creative juices in me. Sun streamed through tinted glass, warming the area. Several members motioned for me to sit close to them. They were completing hand-held projects, and, judging by the small bag clutched in my sweaty fingers, our level of stitching fit perfectly. That is where I met Marge Speelman. Old enough to be my mother, Marge reminded me of everything that had been missing from my life since my mother’s death thirty years before. Gracious, quiet, wise, and full of stories. Remembrances that she fussy cut from a wide swath of life’s fabric. From the old neighborhood. From the Second World War. From the years of raising a family. Every month, I waited for the next nine-patch of memories. Marge and I never got much piecing accomplished, but, as Marge shared her soul, the pattern of my own story slowly pulled together. Her patient friendship healed parts of my scrappy past. Friendship needled a golden thread that secured two hearts. The pot luck dinner, in which everyone participated, became the “tie that binds.” Chit-chat over food always included advice and support, information and appreciation. It was a time when medical knowledge was shared, condolences for deaths, and the celebration of new life took place. Confidences about wayward children were whispered with promises for prayer circling the table. Stress levels that hit the ceiling when the sew-ers arrived now took a running stitch to a tidy knot. As the last chocolate brownie disappeared, the sewing resumed. When my teenaged granddaughter expressed interest in quilting, I brought her along. Kaeley is vivacious, impulsive, opinionated and creative. The group opened their arms to her, embracing her enthusiasm. Jan Bos taught her to pace the rhythm of her bobbin. Under the guidance of Joyce Beenes, Kaeley and I finished a State Bird/Flower quilt that had been started several decades before by my mother. Kaeley sleeps beneath the love of her great- grandmother and grandmother at college. The warmth of the quilt is drawn from the kindness of the textiles artists in that group who taught Kaeley lessons in stitchery and how to fit into womanhood. Cleo Lampos with her granddaughter and the finished quilt started by Cleo’s mother in the Dust Bowl with feed sack muslin squares and transfers from newspapers. 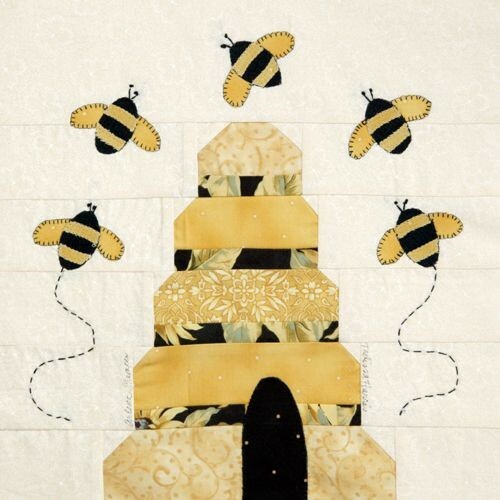 Historically, women have met in quilting bees for necessity and pleasure. Nothing has changed, except the amount of fat quarters that are hoarded in closets. The Swap and Exchange groups still meet. Quilters drag out their UFO’s (Unfinished Projects). But the main ingredient in quilting, the backing, is always present in every meeting where women circle the tables. The sessions with the quilters carried me through my last years of teaching and into retirement. 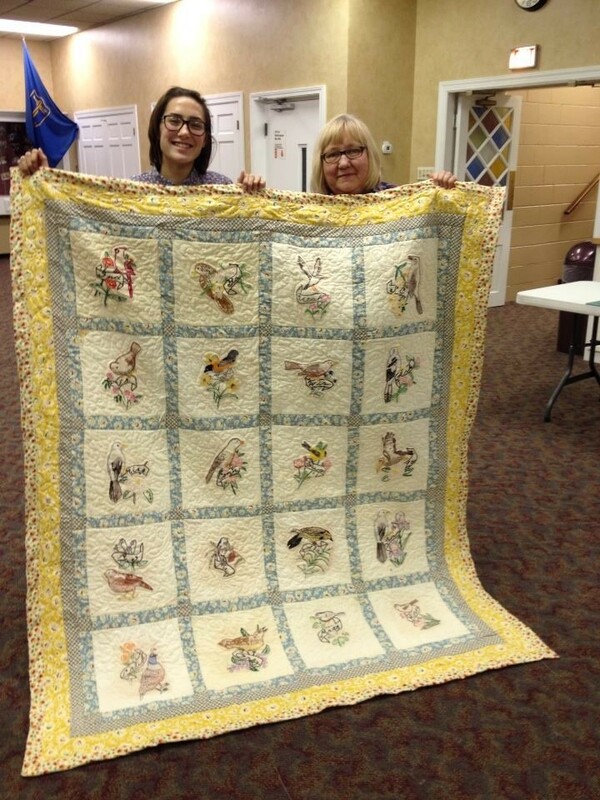 The friendships, the completed projects, and the closeness of being with a group whose long arms hug tight is the joy of belonging to a Quilting Bee. As the last knot is tied, it is time to contemplate the iconic words of Shakespeare: “To be or not to be”. That’s easy. I prefer to Bee. A book of essays that highlight the artistry of quilters in many settings throughout history. Not a picture book, but a story book that brings the heart of quilters alive. E-book and print will be available on amazon.com. What a lovely and heartwarming post, Cleo. Love the way you combine the stitching terms with your emotions to make the perfect sentence.